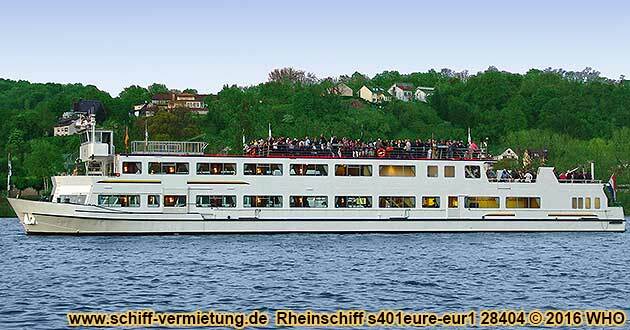 Rhine River boat s401eure-eur1, length 55 m, width 9,60 m, with departure in Andernach, Koblenz, Ober-Lahnstein and Boppard on the Rhine River. Approved up to 500 people. Up to 460 seats below deck. round cruise boat ticket(s) for adults and children from 15 years offer no. RIF0905eure-te together with 2-course menu per person 75 EUR. There is a 19% added value tax included in the boat ticket price. Price change because of tax increase, diesel price increase, increase of the firework fee etc. possible until 4 months prior to the boat cruise date. If there is a price increase you have the right to cancel the boat tickets free of charge. Saturday, September 14, 2019, Oberwesel on the Rhine river. Boat trip to Rhine in Flames, Aflame  the night of the thousand fires with round trip. Boat parade from the Lorelei rock to Oberwesel on the Rhine river. Musical brilliant firework. Wine stands and booths at the wine market in Oberwesel. Departure in Ober-Lahnstein on the Rhine river (right Rhine river bank) 4:35 p.m. Boat trip along castle Stolzenfels, Rhens with Konigsstuhl (king's chair), Braubach with castle Marksburg, Brey, Spay, Osterspai with castle Liebeneck, Boppard with Kurtrierische Burg (Trier elector's castle), Bad Salzig, Kamp-Bornhofen with the "Feindlichen Brudern" ("Enemy brothers") castle Sterrenberg and castle Liebenstein, Hirzenach, Wellmich with castle Maus (mouse), St. Goar with castle Rheinfels, St. Goarshausen with castle Katz (cat). Here the boats gather together for the boat cruise parade along the bengal lighted Lorelei rock to Oberwesel with bengal lighting "Night of the thousand fires" ("Nacht der Tausend Feuer") from the town wall, towers, churches and the castle Schonburg, musical big firework "Rhine in flames / Rhine aflame". Seat under deck, starting 6:00 p.m. DJ music and dance. The fireworks can be seen from the open air or upper deck. Return in Ober-Lahnstein about 11:10 p.m. No disembarkation possible in Oberwesel. 561-lwei Hotel in Ober-Lahnstein on the Rhine River near the landing stage for the boat trip Rhine in Flames. Departure in Boppard on the Rhine river (left Rhine river bank) 6:15 p.m. Boat trip along Kurtrierische Burg (Trier elector's castle), Bad Salzig, Kamp-Bornhofen with the "Feindlichen Brudern" ("Enemy brothers") castle Sterrenberg and castle Liebenstein, Hirzenach, Wellmich with castle Maus (mouse), St. Goar with castle Rheinfels, St. Goarshausen with castle Katz (cat). Here the boats gather together for the boat cruise parade along the bengal lighted Lorelei rock to Oberwesel with bengal lighting "Night of the thousand fires" ("Nacht der Tausend Feuer") from the town wall, towers, churches and the castle Schonburg, musical big firework "Rhine in flames / Rhine aflame". Seat under deck, starting 6:00 p.m. DJ music and dance. The fireworks can be seen from the open air or upper deck. Return in Boppard about 10:30 p.m. No disembarkation possible in Oberwesel. boat tickets for children from 10 to 14 years with own seating place offer no. RIF0905eure-te together with 2-course menu per child 75 EUR. boat tickets for children until 9 years with own seating place offer no. RIF0905eure-te together with 2-course menu per child 75 EUR. Giving of the boat tickets only together with 2-course menu. Advanced meal order necessary. On this boat, you can only choose between the below mentioned meals. No other meals are offered during the firework events on this boat. The boat line doesn't accept ticket reservation(s) without selection of a meal. If you don't choose a meal, we assume that you wish the first meal "Pork goulash" and will reserve "Pork goulash " for you. The later change of the meal reservation by groups with less than 15 people is liable and is to be paid by the customer. The later change of the meal reservation by groups with 15 or more people is liable and only has to be paid by the customer after a bill has been issued. and 20 EUR bank notes (= 8 drink coins of 2.50 EUR each). It is NOT possible to draw coins with 5 EUR bank notes and 50 EUR bank notes. Unneeded drink coins will be refunded at the board bar when you leave the boat. Advance invoice for drink coins only possible for groups from 15 people on request.